1 Bring the chicken stock to a boil, then add the polenta and simmer for 5 minutes. Stir in the Pecorino, then spoon into an oiled 17cm x 27cm slice pan, then refrigerate until firm. Toss the lamb cutlets with the peri-peri-seasoning, salt, pepper and 1 Tbsp extra virgin olive oil. 2 Mix the hazelnuts, garlic, zest, juice, spices, sourdough and remaining extra virgin olive oil in a food processor and purée until smooth. Season with salt and pepper. 3 Cut the polenta into squares, sprinkle with cooking oil spray, then cool on a hot barbecue grill for 3 minutes. 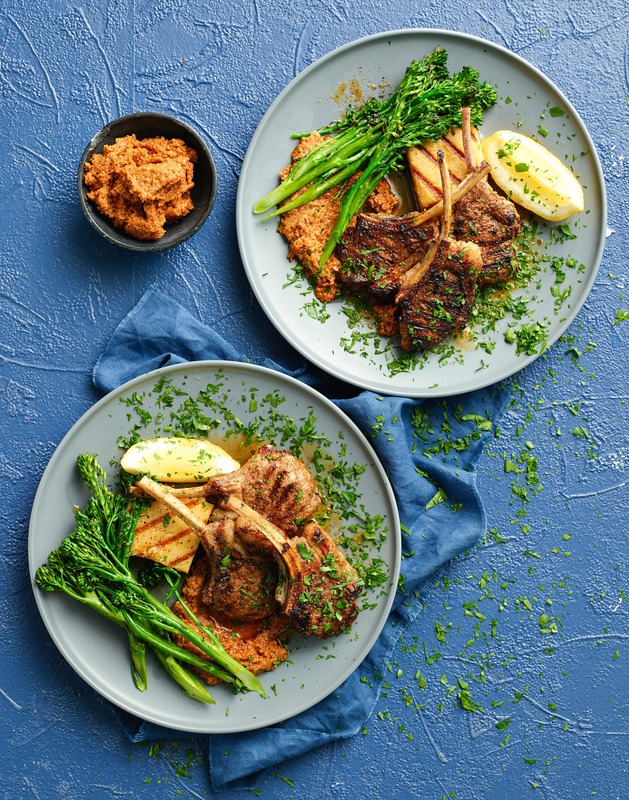 Cook the lamb cutlets on a hot barbecue grill for 4-5 minutes, until medium. Serve with polenta, romesco, broccolini and chopped parsley.